Q: The US President Donald Trump delivered a speech to elaborate on the policy of the United States on Afghanistan and South Asia today. He is critical of Pakistan in terms of counter-terrorism. What is your reaction to this? A: We have noted the relevant report and hope that the relevant policy of the United States can help to promote the security, stability and development of Afghanistan and the region at large. Pakistan is at the forefront of the counter-terrorism efforts. For many years, it has made positive efforts and great sacrifices for combating terrorism and made important contributions to upholding world peace and regional stability. We believe that the international community should fully recognize the efforts made by Pakistan in fighting terrorism. The Chinese side supports the international community in enhancing the international counter-terrorism cooperation and forming synergy. We welcome the counter-terrorism cooperation conducted by Pakistan and the United States on the basis of mutual respect and their joint commitment to the security and stability of the region and the world. Q: Foreign Minister Wang Yi recently visited both Pakistan and Afghanistan with the view of improving Pakistan-Afghanistan relations and easing the tense situation. In his speech, Mr. Trump came very heavily against Pakistan, especially for not cracking down on Taliban. How will the speech of President Donald Trump and the US decision to enhance troops in Afghanistan have an impact on China's policy towards Afghanistan? A: The Chinese side is always committed to developing friendly relations and cooperation with other countries on the basis of the merits and demerits of the matter, our long-held position of objectiveness and fairness and the Five Principles of Peaceful Coexistence. I have said just now that we have noted the relevant speech of President Donald Trump and hope that the relevant policy of the United States can be conducive to promoting the security and stability of Afghanistan and South Asia. We also hope that the United States and Pakistan can carry out counter-terrorism cooperation on the basis of mutual respect and make concerted efforts for regional security and stability. China attaches great importance to the Pakistan-Afghanistan relations and maintains that the sound and steady Pakistan-Afghanistan relations serve the common interests of the two countries and the region at large. Not long ago, Foreign Minister Wang Yi visited Afghanistan and Pakistan upon invitation and mediated for the improvement of the Pakistan-Afghanistan relations and the advancement of the reconciliation process in Afghanistan. During the visit of Foreign Minister Wang Yi, the two countries showed goodwill towards each other and what needs to be mentioned is that they agreed to set up the bilateral crisis management mechanism. Going forward, the key is that the two sides need to conduct concrete consultations on how to put this mechanism into effective function so as to work out viable methods to truly bring the role of the mechanism into full play. Recently, Pakistan and Afghanistan have conducted a series of friendly engagements and dialogues which are appreciated by the Chinese side. We hope that the two sides can continue to take positive measures to improve their relations. In the process of the improvement of their relations, as their friend and neighbor, China is willing to continuously play a constructive role as its capacity allows. Q: President Donald Trump said in his speech that the United States would develop closer relations with India. Given the standoff between China and India in Dong Lang and the recent incidents between India and Pakistan, how will the closer US-India relations affect India-China relations? China's policy concerning India's joining in the Nuclear Suppliers Group (NSG) and the listing of the 1267 Committee has caused a lot of negative effects on India-China relations and also given space to the United States to move closer to India. What is your comment? A: We welcome the normal and friendly relations developed between the United States and India as long as the relations do not harm the interests of other countries and can contribute to regional peace, stability and development. We hope that the normal development of the US-India relations can play a constructive role in regional peace and stability. As for whether the development of the closer US-India relations will affect China-India relations, the growth of friendly relations between China and any other country will not target any third party and we hope the growth of US-India relations will not target any third party, either. I hope the trilateral relations among China, the United States and India can constitute a virtuous interaction since this serves the common interests of the international community and the fundamental interests of the people in the three countries. Regarding India's joining in the NSG and the listing of the 1267 Committee, we have stated our position multiple times and I will not repeat it. The Indian side should think over or reflect on what impact its recent illegal trespass of the boundary in Dong Long has had on the Chinese people. The fact that India illegally crossed the boundary is clear-cut, the excuse is absurd and the logic cannot hold water at all. We have also taken note of the recent words and deeds of India and hope that India can live up to its words and translate its remarks that it hopes to develop peaceful relations with its neighbors into concrete policies. Q: According to the report of the Philippine Commercial News, in response to the remarks that "China invaded the territory of the Philippines" made by the Senior Associate Justice Antonio Tirol Carpio, President Duterte said "We haven't been invaded. This is not the fact. They are just there, but they do not claim anything." at the press conference held at the presidential palace on August 21. What is your comment? 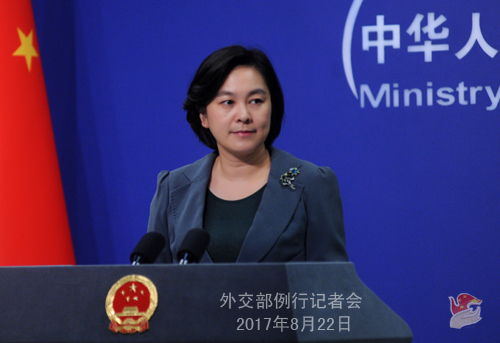 A: The Chinese side has noted the relevant report. The attempt of some individuals in the Philippines who made irresponsible condemnation against China is nothing but stirring up disputes between China and the Philippines. I am afraid they may harbor ulterior motives. I would like to stress that the Chinese side is always committed to peacefully resolving relevant disputes through negotiation and consultation with the sovereign states directly concerned. China stands ready to work with the ASEAN countries, including the Philippines, to implement the Declaration on the Conduct of Parties in the South China Sea (DOC) in a comprehensive and effective manner, deepen maritime pragmatic cooperation, actively advance the consultations on the Code of Conduct in the South China Sea (COC), jointly uphold the hard-won sound situation of the South China Sea and move forward the positive development of the China-Philippines relations. Q: To our knowledge, Russian Deputy Foreign Minister Igor Morgulov recently paid a visit to Beijing. Have China and Russia exchanged views on the current situation on the Korean Peninsula? A: On August 21, Assistant Foreign Minister Kong Xuanyou met with Russian Deputy Foreign Minister Igor Morgulov in Beijing and they exchanged views on the Korean Peninsula issue. The two sides are highly concerned about the development of the situation on the Korean Peninsula and reaffirmed their commitment to the goal of the denuclearization of the Peninsula. They both believe that under the current circumstances all relevant parties need to exercise restraint, avoid the words and deeds that could escalate confrontation and tensions, exert greater diplomatic efforts for the resumption of dialogue and consultation and play a constructive role for the political settlement of the Korean Peninsula issue. Q: The so-called "Defense Minister" of Taiwan is going to Central America but will stop in New York and Los Angeles. Has China required the US not to engage in any kind of official meeting during those stopovers? A: I have noted the relevant report. 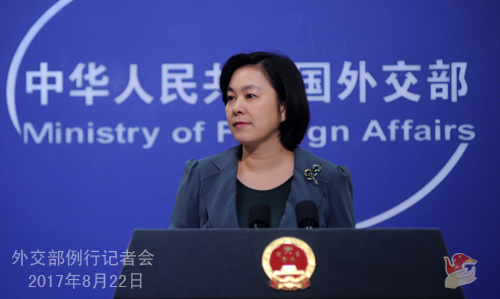 The Chinese side is always handling the foreign exchanges of Taiwan in accordance with the one China principle and we firmly oppose the countries that have established diplomatic relations with China to conduct any form of official contact or have any form of military relationship with Taiwan. Our position in this respect is clear-cut and consistent and we believe the US is quite clear about this. Q: According to the report of Kyodo news agency, Japanese Foreign Minister Taro Kono will attend the Ministerial Meeting of the Tokyo International Conference on African Development (TICAD). He will call for the importance of the "rule of law" and "freedom of navigation" and seek consensus with the participating countries in response to the enhancing maritime activities on the part of China at the meeting. What is your comment? A: I have taken note of the relevant report. Just as its name implies, the goal of TICAD is supposed to support African countries in achieving peace and development. If the report mentioned by you is true, then it shows that Japan has ulterior motives. Currently, with the concerted efforts of China and ASEAN countries, the situation in the South China Sea has been stabilized and cooled down and shown the sound momentum of positive development. We require Japan to translate its remarks on improving China-Japan relations into concrete actions, match its words with its deeds, respect the efforts of regional countries to uphold the peace and stability of the South China Sea and take more constructive steps in this regard. Q: Yesterday, India's Home Minister Rajnath Singh said that the solution to the Dong Lang standoff between India and China will be found soon and he hoped that China would take a positive step in resolving this issue. He also said India has not attacked any country so far and none does it have any ambition to expand its border. What is your comment? A: I have noted the relevant report. China cherishes and firmly upholds peace. 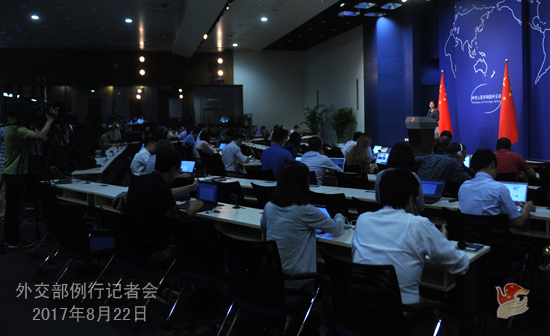 Meanwhile, China is resolute in safeguarding national sovereignty and territorial integrity and will not allow any country or anyone to endanger its territorial sovereignty under any excuse or pretext. We have said many times that the prerequisite and basis for the settlement of the Indian border troops' illegal crossing of the boundary in Dong Lang is the unconditional withdrawal of all the trespassing Indian personnel and equipment to the Indian side of the boundary. I have noted that Minister Singh said that the Indian side has not attacked any country and has no ambition to expand its boundary. However, the fact we have seen is that the Indian side illegally crossed the mutually recognized boundary that has been abided by the two sides for nearly 130 years and so far its border troops still stay in the territory of China and it even fabricates all sorts of excuses to justify its action. We hope India can match its words with its deeds, immediately pull back all the trespassing personnel and equipment and take concrete and positive steps to correct its previous wrongdoing. Q: According to a UN Report, two North Korean shipments to the Syrian Chemical Weapons Agency were intercepted in the past 6 months. And those shipments would have violated the DPRK-related resolutions of the UN Security Council. What is your comment? A: I am not aware of the information you mentioned. But I can tell you that China always implements the relevant resolutions of the UN Security Council in their entirety. We firmly oppose any country or anyone to develop and stockpile chemical weapons and this position is consistent and clear-cut. Q: According to the report of the Times of India, on August 21, an anonymous Indian official said that recently India discussed with Russia its standoff with China in Dong Lang and reiterated its position that by constructing a road, China was unilaterally changing the status quo and this had serious security implications for India. The Indian side is looking for support from Russia. What is your comment? A: Dong Lang is indisputably China's territory. The Indian side illegally crossed the boundary under the pretext of its so-called concern about China's construction of road. This excuse is ridiculous, the nature of this incident is serious and the fact is there for all to see. The only prerequisite and basis for resolving this incident is that the Indian side immediately and unconditionally withdraw all the trespassing personnel and equipment. We can imagine that if we connive in this absurd logic of India, does it mean that if someone detests the activities in his neighbor's house, he can break into the neighbor's house at will and linger in it? If we follow the logic of India, does it mean that if China believes that the large-scale infrastructure construction in the boundary area on the part of India poses a threat to China's security, it can be justified for us to send troops to cross the boundary to enter India to stop it? If so, the whole world would descend into chaos and the norms governing international relations would become useless. So far, China has exercised utmost restraint. We can show our utmost patience and tolerance, but we hope that India, as a major country, can adopt the responsible attitude of abiding by the law and respecting the fact and make reasonable and wise judgment and decision.